(Central Islip, N.Y., March 6, 2015) – The three-time Atlantic League champion Long Island Ducks today announced the signings of outfielder Evan Crawford and pitcher Sergio Perez. Crawford and Perez each return for their second season with the Ducks. In an additional transaction, pitcher Bobby Blevins has been signed by Brother Elephants of the Chinese Professional Baseball League in Taiwan. Crawford joined the Ducks in August of 2014. During 15 games with Long Island, he batted .378 with three RBI, eight runs, two doubles and seven stolen bases. The 26-year-old hit safely in each of his first eight games with the Ducks and reached base safely in all but two games. Prior to his time on Long Island, Crawford spent all of 2013 and the beginning of 2014 with the River City Rascals of the Frontier League. He combined to post a .273 batting average with five home runs, 43 RBI, 69 runs, 22 doubles and 41 stolen bases in 130 games. The St. Louis native has previously played in the San Francisco Giants and Chicago Cubs organizations, reaching as high as Single-A with both. An alum of Indiana University, Crawford was originally drafted by the Giants in the ninth round of the 2009 amateur draft. Perez also joined the Ducks last August and appeared in 20 games out of the bullpen. He compiled a 1-1 record with a 2.36 ERA, one save and 13 strikeouts in 19 innings of work. The right-hander tossed seven consecutive scoreless appearances to begin his Ducks career and allowed a run in only four of his 20 games with Long Island. The 30-year-old has played nine seasons of professional baseball. He has spent time in both the Houston Astros and Oakland Athletics organizations, reaching as high as Triple-A with the Astros from 2010-12. The University of Tampa Alum also played for Team Spain in the 2013 World Baseball Classic. He enters the 2015 season with a career ERA of 4.37 and 435 strikeouts in 186 games (110 starts). Perez was originally drafted by the Astros in the second round of the 2006 amateur draft. Blevins departs the Ducks after having signed with Long Island on Monday, March 2. 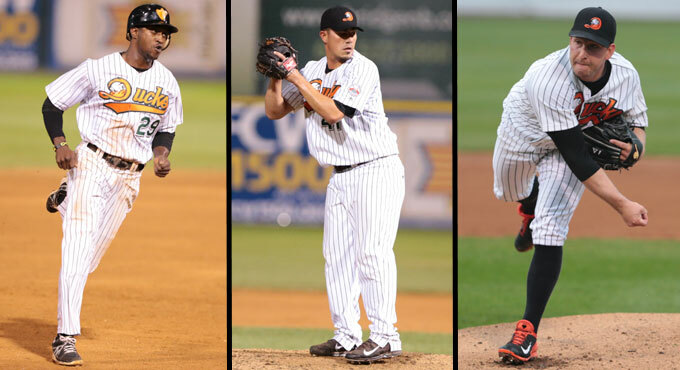 The right-handers spent all of 2014 with the Ducks and ranked second in the Atlantic League in innings pitched (189.1) and complete games (3), third in ERA (2.95) and games started (27), and sixth in strikeouts (119). For his Ducks career, Blevins is 11-6 with a 3.00 ERA and 145 strikeouts to just 44 walks in 35 games (33 starts).